David Garrick (29 January 1947 – 28 February 1985), better known by his stage name David Byron, was a British singer and songwriter, best known in the early 1970s as the lead vocalist with the rock band Uriah Heep and recognized for his charismatic stage presence and his operatic voice. Danish heavy metal vocalist King Diamond cites Byron as his favorite vocalist of all time. 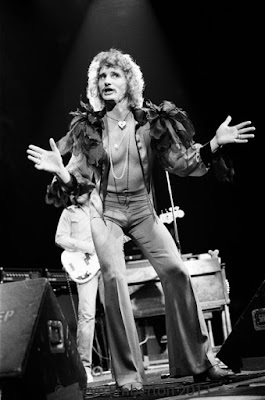 From mid-60s to early 70s David Byron did session work for a company called Avenue Recordings, singing lead and backing vocals (occasionally along with Mick Box on guitar and Paul Newton on bass). These were cover versions of Top 20 hits and were released on EPs & LPs. His first venture into professional music was with an Epping-based semi-pro band called The Stalkers who also featured guitarist Mick Box. Byron and Box worked well together and teamed up to form the band Spice which also featured Paul Newton on bass and Alex Napier on drums. The band gigged extensively locally under the management of Paul Newton's father and they secured a recording deal with United Artists who issued the band's one and only single "What About The Music/In Love" (UP 2246), copies of which now fetch around $50 to $100 on the collectors market. He was the lead vocalist for Spice (1967–1969). Although Spice regularly played venues like the Marquee it wasn't until they met up with manager Gerry Bron that things began to happen. Deciding that the Spice sound would require keyboards; they recruited keyboardist/guitarist/singer/songwriter Ken Hensley, who was Paul Newton's bandmate in The Gods. The band rehearsed and played diligently and during this time Bron redubbed the band Uriah Heep from the Charles Dickens classic David Copperfield. Shortly afterward the band's career really took off, first in Germany, Britain and finally the States. In 1971 David also appeared on two LPs by John Schroeder. He became most famous as the original singer of the English rock band Uriah Heep between 1969 and 1976. 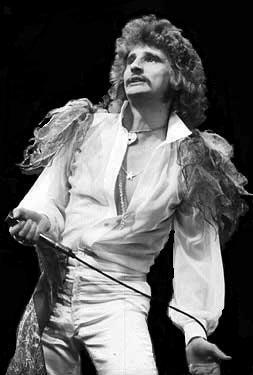 David Byron sang on ten Uriah Heep albums: Their first "Very 'eavy Very 'Umble" (originally slated as a Spice release which becomes apparent after listening to "The Lansdowne Tapes",) "Salisbury", "Look at Yourself", "Demons And Wizards", "The Magician's Birthday", "Live", "Sweet Freedom", "Wonderworld", "Return To Fantasy", and "High And Mighty". During these six years David Byron gained a reputation with his operatic vocals and harmonies as one of the best rock vocalists and frontmen in the world. In 1975 Byron released his first solo album, "Take No Prisoners" (Bronze Records ILPS 9824) which also featured fellow Heep members Mick Box, Ken Hensley and Lee Kerslake. But unfortunately for Byron, he'd also gained a reputation for hard drinking which eventually led to him being sacked from Uriah Heep at the end of a Spanish tour in July 1976. Ken Hensley said at that time, "David was one of those classic people who couldn't face up to the fact that things were wrong and he looked for solace in a bottle". Ahead of his dismissal, Uriah Heep had secured a replacement singer. Their manager at the time, Gerry Bron, said Byron had been released in "the best interest of the group". Bron explained that Byron and the other Heep members had been in disagreement for some time over fundamental issues of group policy, and that the differences had been finally brought to a head following the band's recent tour of Britain and Europe. "It was felt by the rest of the group that they could no longer reconcile David's attitude with their own", commented Bron. Byron recorded three solo albums: "Take No Prisoners" in 1975, "Baby Faced Killer" in 1978, and "That Was Only Yesterday". The latter was recorded in 1984, one year before his death. Byron died of alcohol-related complications, including liver disease and seizures, at his home in Berkshire on 28 February 1985. He was 38 years old. On BBC Radio's The Friday Rock Show Tommy Vance played "July Morning" in tribute. On the "Equator" tour, around the time of Byron's passing, Uriah Heep would dedicate "The Wizard" to him.